Footballers are often ridiculed for having more money than sense, and it is little wonder when they are responsible for monstrosities like the 2012 FIFPro World XI. The best team of the last calendar year, as voted for by approximately 45,000 professional footballers around the globe, produced an all-La Liga line-up consisting of just one player – Atletico Madrid’s Radamel Falcao – who is not contracted to either Barcelona or Real Madrid. If the Fifa Ballon d’Or is traditionally regarded as the most prestigious individual prize in football, then the FIFPro XI considers itself the most distinguished team construct. However, any credibility that the Fifa-backed award has acquired since its creation in 2005 has now all but disappeared. 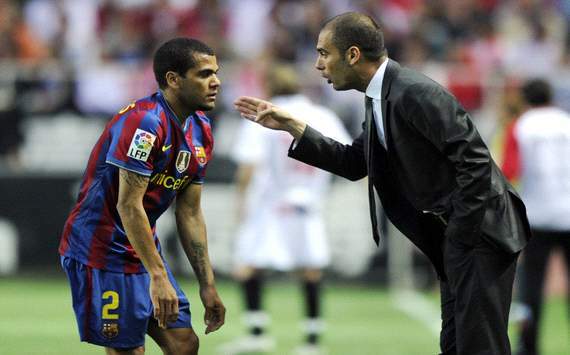 The most bizarre inclusion was that of Dani Alves at right-back. At the start of last season, the Brazilian was arguably the best full-back in world football. But 2012 was his worst year since arriving in Spain, as he endured problems with Pep Guardiola and then spent time on the bench under Tito Vilanova. There were numerous superior right-backs in Europe, including Borussia Dortmund’s Lukasz Piszczek, Juventus’ Stephan Lichtsteiner and Shakhtar Donetsk’s Darijo Srna, to name just a few, all of whom – unlike Dani Alves – won a league title in 2012. The footballers who picked Alves clearly chose him on reputation, and watched little to no German, Italian or Ukrainian football. Most will have barely heard of Piszczek, let alone be capable of spelling his name on a ballot paper. His Barcelona team-mate Gerard Pique also fell out with Guardiola, but his greatest personal achievements of 2012 came off the pitch with Shakira. He certainly had plenty of time to spend with his beautiful Colombian girlfriend as he missed almost half of the 2011-12 Liga season and struggled for form when his footballing partner Carles Puyol was sidelined with injury. In Pique’s favour is the fact that, in addition to winning Euro 2012, this is possibly the worst era for defenders in almost 50 years. But, the likes of Thiago Silva and Mats Hummels were surely more worthy candidates to be considered alongside Sergio Ramos. Marcelo’s addition at left-back is no disgrace, once again due to the dearth of top quality full-backs in the game, but a player who was twice dropped for crucial Real Madrid clashes at the end of last term (the Liga decider in April at Barcelona, and the Champions League semi-final first-leg versus Bayern Munich) should not be preferred to Ashley Cole, who was heroic throughout Chelsea’s road to glory. That the Champions League winners, however fortunate they were to lift the trophy, have no representation in the FIFPro XI is somewhat absurd. The ultimate insult, though, was the exclusion of Andrea Pirlo. The Italian magician will go down in history as one of the best centre midfielders of all time, and 2012 was his annus mirablis as he led Juventus to Scudetto glory without losing a game, before winning three man-of-the-match awards on his way to taking Italy to Euro 2012 silver. In the current campaign he has been just as dominant. The fact that Pirlo was overlooked by a majority of 45,000 voters makes you lose faith in democracy, particularly as the former AC Milan star has been hailed in the world media on an almost daily basis since his Euro 2012 quarter-final masterclass against England. Football today may have become monopolised by a small group of rich, elite clubs, but Barcelona and Real Madrid – neither of whom made the Champions League final in 2012 – are not the only two teams in world football. Andres Iniesta’s insertion in the midfield three is a no-brainer, but the additions of Xavi and Xabi Alonso ahead of Pirlo demonstrates an embarrassing bias towards the Clasico couple. Even the selection of Atletico Madrid superstar Falcao, alongside Cristiano Ronaldo and Ballon d’Or winner Lionel Messi, is debatable given the presence of equally brilliant candidates such as Robin van Persie, Didier Drogba and Zlatan Ibrahimovic, but it is Pirlo’s absence that has rightfully created all the headlines. The Fifa Ballon d’Or itself has suffered its fair share of criticism in recent times, from the snubbing of Wesley Sneijder in 2010, to the bizarre inclusion this time around of Pep Guardiola in the top three of the coaching category. But its credibility is still just about intact. This is sadly not the case any longer with the FIFProXI.